A bill co-sponsored by AEE to give a boost to electric vehicles in California got a boost itself last week with a well-covered press conference highlighting the measure, which would establish an ambitious program to stimulate EV purchases. 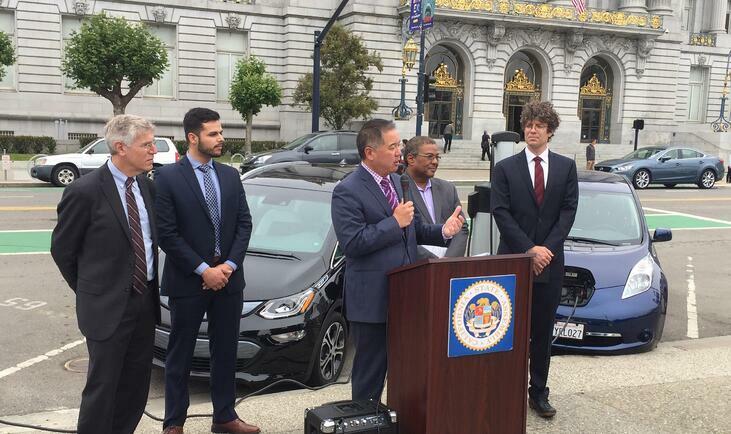 The bill’s author, Assemblymember Phil Ting, hosted the press event at a set of charging stations across from San Francisco City Hall. “We need a more robust incentive program to jump-start the market so that everyone can get behind the wheel of an electric vehicle,” said Ting. His bill, AB 1184, is intended to do just that – backed by a pool of up to $3 billion for EV-buying incentives. AB 1184, which we’ve written about before, has already passed the California Assembly, but new bill language provides more detail about the California Electric Vehicle Initiative (CEVI) it would establish. Modeled on the successful California Solar Initiative, which provided rebates for solar power installations that declined over time as the industry grew and technology costs came down, CEVI will provide point‐of‐sale rebates to EV buyers, with the rebate value scaled down as state EV sales hit certain milestones, dropping to zero when the target of 1.5 million EVs is reached. CEVI rebates would be redeemed at car dealerships, reducing the sale price right at the time of purchase and eliminating the need to file rebate applications with the state. They would be valued initially to make the cost of battery-powered vehicles comparable to similar models of gasoline‐powered vehicles, after federal and other credits. Also, rebates would operate on an income scale, with low‐income buyers eligible for higher amounts. The program would be administered by the Air Resources Board, in coordination with the California Public Utilities Commission and the California Energy Commission. The $3 billion of incentives would come from a portfolio of taxpayer‐neutral sources. AB 1184 also calls for investing $500 million per year in cap and trade program funds for existing programs aimed at ensuring that disadvantaged communities, school and transit buses, and freight benefit from transportation electrification. Today, there are roughly 300,000 EVs on California roads – a far cry from the 1.5 million vehicle target for 2025 set by Gov. Jerry Brown. CEVI is geared to meeting that target and, more importantly, creating a self-sustaining market for EVs that will reach 5 million vehicles by 2030. AB 1184 is currently winding its way through the California Senate. On Monday, the Senate Energy Committee held a hearing on the bill and approved it with clarifying amendments suggested by staff. Similarly, the Senate Environmental Quality committee heard the bill on Wednesday and approved it with possible additional amendments from staff. These and other amendments will appear in print once the bill reaches the Appropriations Committee before heading to the Senate floor for a final vote, which will take place after the Legislature returns from its summer break in mid-August. Keep up-to-speed on all state legislative and regulatory action with AEE's PowerSuite, your one platform for complete coverage of state energy policy nationwide.